These Dipped Marshmallows are large campfire marshmallows with two stages of dipping. 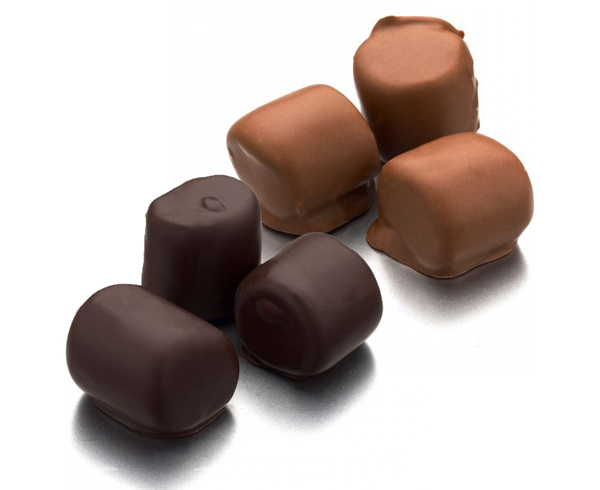 We use premium dipping chocolate to en-robe our regular caramel dipped marshmallows. Variations in individual size, shape, color, and weight are normal. Approximately 6-8 pieces per pound. INGREDIENTS(subject to change with out notice): Marshmallows(Corn Syrup, Sugar, Dextrose, Modified Corn Starch) Caramel(Sugar, Corn syrup, Milk, Fructose, Coconut oil, Butter, Mono and Diglycerides, Salt, Soy lecithin(emulsifier), vanillin.) Dipping Chocolate(Sugar, Partially Hydrogenated Palm Kernel and Cottonseed Oils, Nonfat Dry Milk, Cocoa Processed with Alkali, Cocoa, Glyceryl Lacto Esters of Fatty Acids, Soy Lecithin, and Salt.) ALLERGENS: CONTAINS: Milk, Soy.